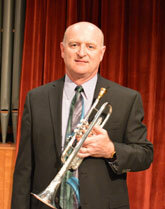 Richard J. Rulli is Professor of Trumpet at the University of Arkansas where he teaches trumpet and brass chamber music. He performs as a founding member of the Boston Mountain Brassworks (UA faculty brass quintet), Principal Trumpet of the Symphony of Northwest Arkansas, and with the Fayetteville Jazz Collective. He earned degrees from the University of Wisconsin–Madison (DMA), Ithaca College, NY (MM), and the University of Northern Colorado (BM/BME). Dr. Rulli is a 2009 University of Arkansas Faculty Gold Medal recipient for his support of students as a faculty mentor in performance and advising. Dr. Rulli has been a featured performer and clinician internationally at conventions of the International Trumpet Guild (ITG) and International Brass Festival, and nationally at the College Band Directors National Association Southern Division Convention, as well as the state educators conventions of Arkansas, Georgia and Wisconsin. Formerly, he was the Principal Trumpet and Trumpet Soloist of the Air Force Band of the Golden West. His trumpet teachers include John Aley, Malcolm McNab, Donald Green, Anthony Plog, Kim Dunnick, Frank Campos, William Pfund, and Daniel Kuehn.